Speaking to a select committee of MPs, a housing association chief executive warned that people in part-time work are punished disproportionately by the policy and many could be better off unemployed. Under the policy, people considered to be underoccupying social homes face reductions to their benefits of up to 25% of their total rent. Those only receiving partial housing benefit because they are in part-time work are penalised the same amount as those who receive housing benefit that covers their full rent amount. The bedroom tax could therefore be a "perverse disincentive to work," said Carol Matthews. Community Shop in Goldthorpe gives local shoppers access to surplus food from supermarkets for up to 70% lessBritain's first "social supermarket" opens its doors on Monday, offering shoppers on the verge of food poverty the chance to buy food and drink for up to 70% less than normal high-street prices. Membership of the pilot store – in Goldthorpe, an area of social deprivation – will be restricted to people living in a specific local postcode area who also get welfare support. Individuals who shop at Community Shop will not only get access to cheaper food, but will also be offered programmes of wider social and financial support, such as debt advice, cookery skills and home budgeting. Problems surrounding the implementation of a central pillar of government changes to the welfare system are to be examined by MPs. 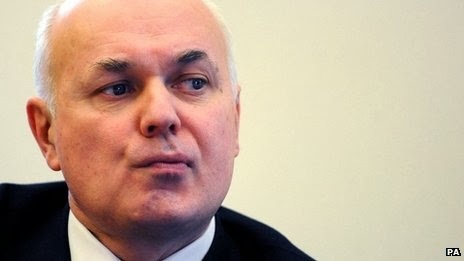 Work and Pensions Secretary Iain Duncan Smith will be asked to explain why the new Universal Credit will not be paid to about 700,000 people until after a planned 2017 deadline. 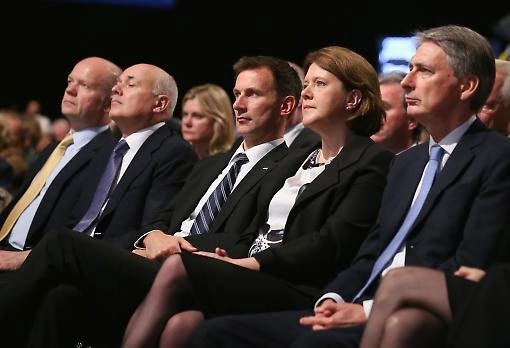 Shadow work and pensions secretary Rachel Reeves said ministers had "been forced to admit that they have completely missed their targets and Universal Credit will not now be rolled out before the election". "David Cameron and Iain Duncan Smith repeatedly promised to deliver their flagship policy, Universal Credit, on time and within budget," she said. "That claim, and the credibility they staked on it, now lie in tatters." 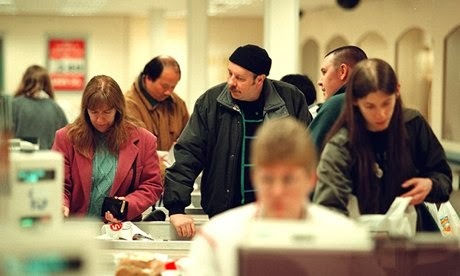 The biggest drop in living standards since the Victorian age is seeing low and middle earners suffering an unprecedented squeeze on their incomes as austerity measures continue to bite, with women and part-time workers disproportionately affected, research reveals today. 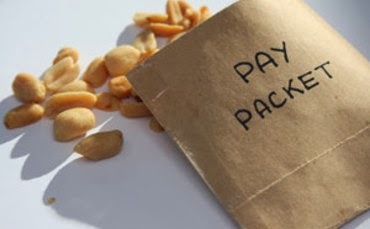 More than five million people are officially classified as low paid and an increasing number of public sector workers are struggling to make ends meet, according to the New Economics Foundation (NEF) think-tank. A surge in the number of people requiring emergency food aid, a decrease in the amount of calories consumed by British families, and a doubling of the number of malnutrition cases seen at English hospitals represent “all the signs of a public health emergency that could go unrecognised until it is too late to take preventative action,” they write. 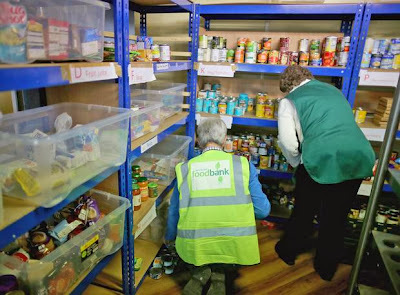 Despite mounting evidence for a growing food poverty crisis in the UK, ministers maintain there is “no robust evidence” of a link between sweeping welfare reforms and a rise in the use of food banks. However, publication of research into the phenomenon, commissioned by the Government itself, has been delayed, amid speculation that the findings may prove embarrassing for ministers. More than 50,000 people in have signed a petition calling for Parliament to hold a debate on the causes of food poverty in the UK. The petition was launched on Monday by the writer and former food bank user Jack Monroe. We need to stop turning a blind eye.” The petition has been backed by the Unite union and the national food bank charity the Trussell Trust. 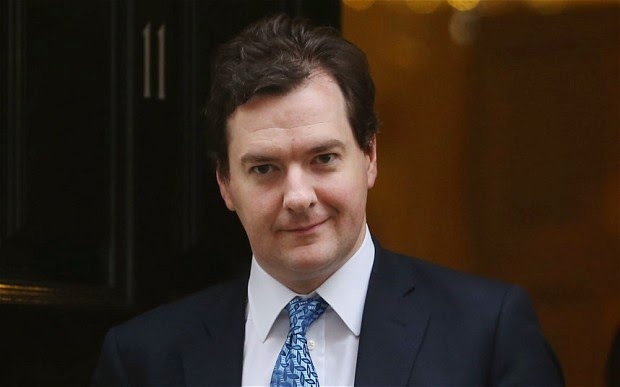 The Chancellor will use his Autumn Statement on Thursday to set out more details of a new cap on welfare spending after the next general election. It is an attempt to put permanent limits on around £100 billion a year of spending on items such as Housing Benefit and some unemployment payments. A committee of MPs has accused ministers of "shifting the goal posts" to reduce the number of households in England classed as in fuel poverty. The definition of fuel poverty would be changed by amendments to the Energy Bill so that 2.4 million were classed as fuel poor rather than 3.2 million. 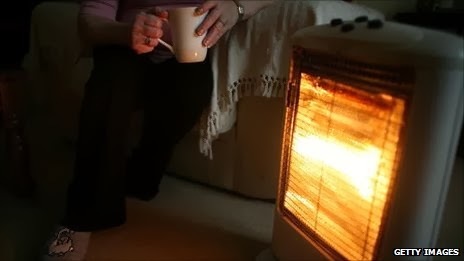 The cross-party committee's report said families were currently classed as fuel poor if they spent more than 10% of income on fuel "to maintain an adequate level of warmth". Under the new definition, families would only be deemed to be in hardship if they had "above average fuel costs" leaving them with "a residual income below the official poverty line". 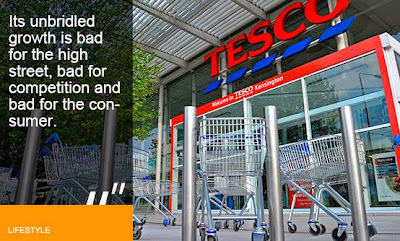 Tesco boss Philip Clarke's turnaround plans will be under fresh scrutiny on Wednesday when the supermarket is expected to reveal a fall in UK sales. Tesco's interim profits tumbled by almost a quarter to £1.39bn after underlying sales declines in the UK and every one of its overseas markets. Lets keep this up!! Take your money away from the big chains and buy local produce. More people are waking up! This is one weapon we have against big business, LETS USE IT!! Threats to take away children from families is a new low for the coalition government's war on benefit claimants. It used to be that when politicians wanted to bury bad news they’d orchestrate its release to time with a distracting event. Seeing Iain Duncan Smith publicly criticized for wasting at least £140 million of public money over Universal Credit at the start of this month, it struck me how we’ve slowly reached another level. “Unmitigated disaster”? “Alarmingly weak”? These words were used to describe Universal Credit but could easily have been levelled at a number of largely unreported changes to the benefit system. Nowadays, bad news is buried by even worse news. The sheer volume of inefficient and unethical changes to social security this Government has enacted means some of it doesn’t even get noticed. Which, for a set of politicians hacking at vulnerable people’s support systems, is worryingly convenient. The scale of the nation's homelessness crisis is laid bare in figures published exclusively in The Independent today which show that the numbers calling the housing charity Shelter for help is at an all-time high of almost 175,000 calls in the last year, up 10 per cent on the previous year. Visits to the advice pages of the charity’s website are also up more than 20 per cent, with almost 400,000 people seeking help online. The latest Government figures show statutory homelessness is up 6 per cent, while the number of households living in temporary accommodation such as B&Bs is at 56,0000, up 9 per cent on last year. 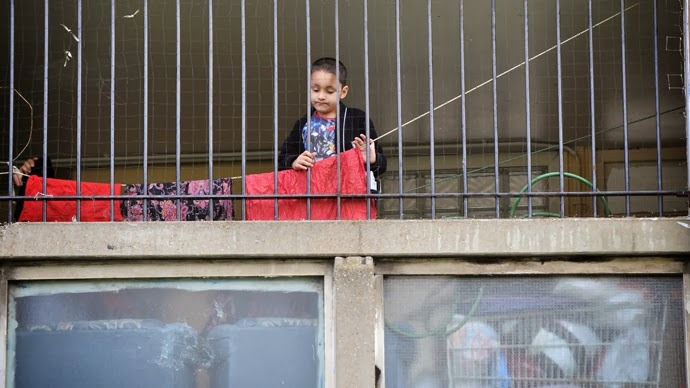 Some 80,000 children are expected to spend Christmas without a proper home. Helpline staff believe the impact of welfare reforms – including the benefit cap, the ‘bedroom tax’ and increasingly punitive benefit sanctions – could be one the reasons behind the marked rise in calls for help. The continued fallout from the recession, the rise of the cost of living and an apparent increase in rogue landlords as the rental market grows have also contributed. It's the reason for the collapse of democratic choice. It's the source of our growing disillusionment with politics. It's the great unmentionable. Corporate power. The media will scarcely whisper its name. It is howlingly absent from parliamentary debates. Until we name it and confront it, politics is a waste of time. On Monday, for instance, the Guardian revealed that the government's subsidy system for gas-burning power stations is being designed by an executive from the Dublin-based company ESB International, who has been seconded into the Department of Energy. What does ESB do? Oh, it builds gas-burning power stations. On the same day we learned that a government minister, Nick Boles, has privately assured the gambling company Ladbrokes that it needn't worry about attempts by local authorities to stop the spread of betting shops. His new law will prevent councils from taking action. 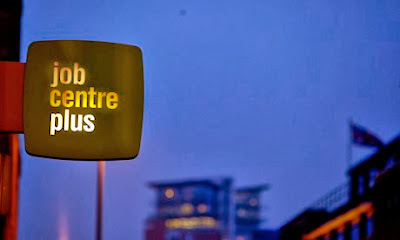 Last week we discovered that G4S's contract to run immigration removal centres will be expanded, even though all further business with the state was supposed to be frozen while allegations of fraud were investigated. Now opposition MPs stare mutely as their powers are given away to a system of offshore arbitration panels run by corporate lawyers. 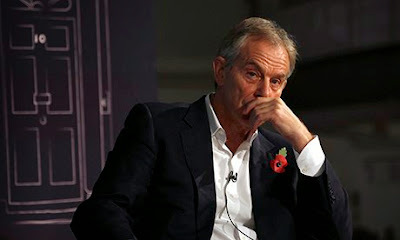 Since Blair, parliament operates much as Congress in the United States does: the lefthand glove puppet argues with the righthand glove puppet, but neither side will turn around to face the corporate capital that controls almost all our politics. This is why the assertion that parliamentary democracy has been reduced to a self-important farce has resonated so widely over the past fortnight. So I don't blame people for giving up on politics. I haven't given up yet, but I find it ever harder to explain why. When a state-corporate nexus of power has bypassed democracy and made a mockery of the voting process, when an unreformed political funding system ensures that parties can be bought and sold, when politicians of the three main parties stand and watch as public services are divvied up by a grubby cabal of privateers, what is left of this system that inspires us to participate? 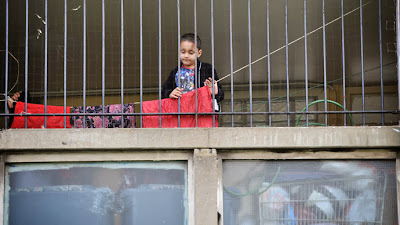 The reality for a growing number of children in poor families in Britain is cold, damp houses and not enough to eat, a new survey by a leading children’s charity reveals, as living standards decline for most people across the country. “This is a damning incitement of how children feel about their chances of their future and the opportunities they will have in life,’ Hersfield told RT. “For millions of children up and down the country, poverty is a grinding reality – and it is getting worse. Many families are facing stark and unacceptable choices, like heat or eat. A separate survey published on Tuesday by another charity, 4Children, shows that an increasing number of families are using the services offered by children’s centers, despite the fact that many are being starved of cash due to local government funding cuts. 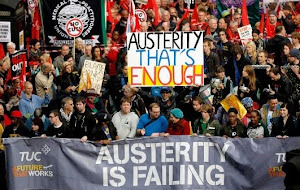 This blog is primarily 'about' the negative affects that the austerity measures in Britain are having, but other British newsworthy articles maybe included from time to time. This is a personal blog and I'll add what interests me, and what I hope will interest you within British politics. The Full Facts: A guide to ESA and ATOS claim form, and medical examination assessments.